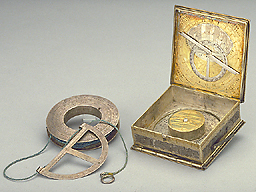 This instrument contains a thread reel, engraved with a zodiac and calendar scale, to which is wound a measure consisting of four different coloured threads joined together consecutively. A protractor moves along the thread. The inside of one of the leaves has a dial with sprung gnomon. The hour lines are designed for the southern hemisphere and for a horizontal dial, but on the sides of the main box are two simple catches to keep it vertical.